His Holiness Paramahamsa Sri Sri Satchidanandendra Saraswati Swamiji, the founder of Adhyatma Prakasa Karyalaya and author of over 200 reputed works on Advaita in Kannada, Sanskrit and English blessed the earth with his presence for ninety six useful and rich years (1880-1975). Our pranams at the holy lotus feet of Swamiji. This is a free rendering of Sri Swamiji’s Sankara Vedanta Prakriye’ (Kannada) which was first written during his Caturmasya Samkalpa at Davangere in the year Manmatha. The Second Edition was published by us in 1959. It has been translated into Telugu and Tamil since, but English-knowing readers who could not understand any of the three Dravidian Languages have continued to press for an English rendering of this popular book. His Holiness has himself undertaken the task at our request. We hope that the valuable contents of this production will now appeal to a wider circle of readers. His Holiness Sri Sri Satchidanandendra Saraswathi Swamiji (1880-1975) has written a number of books on Vedanta in Kannada, Sanskrit and English. While the books in Sanskrit are useful primarily for pundits all over the country, the Swamiji was hopeful that books in English would prove useful to a large number of persons not only in this country but all over the world, who are interested in the study of Vedanta in general and Sankara Siddhanta in particular. Pujya Swamiji established a branch of the Adhyatma Prakasha Karyalaya at Bangalore mainly because; this being an international city would serve as a centre for spreading Sankara Siddhanta all over the world. As most of these books in Sanskrit and English are now out of print and the demand for such books remained unfulfilled, it was felt that a reprint of these books would fill in the breach in this respect. Therefore a reprint project of Pujya Swamiji’s English and Sanskrit works has been launched by Adhyatma Prakasha Karyalaya, Bangalore Branch. This project is now inaugurated by the publication of this reprint of the English book — "Salient Features of Sankara’s Vedanta". We are thankful to Smt. and Sri C.S. Seetharama Rao, Tax—consultant, Jayanagar, Bangalore, who have made it possible for us to reprint and publish this valuable work of Parama Pujya Swamiji, by their generous financial assistance. This donation has been made in the sweet memory of Late C.V. Suryanarayana Rao and Narasamma, the revered parents of Sri C. S. Seetharama Rao. We profusely thank Prof. S.K. Ramachandra Rao who has on our request kindly written the scholarly introduction. It has enriched the value of this book. It not only throws light upon the contents of the book, but also gives an idea about Pujya Swamiji’s life and mission. We are grateful to the authorities of the Adhyatma Prakasha Karyalaya, Holenarsipur for having permitted us to reprint and publish this book. Our heartfelt thanks are also due to all those who have carefully read through the proofs and to many others, but for whose efforts this work could not have seen the light of day. We are also highly thankful to Sri Nithyananda Printers, for their elegant execution of the printing and binding work. We pray that the revered Swamiji bless us with the required strength in executing this project of reprinting all his English and Sanskrit works. There have been a number of books on Sankara Vedanta produced and published in this country and elsewhere. While they are very popular probably because their authorship has been ascribed to the great Sankara, they contain tenets in conflict with one another. Relying upon these as well as the systems contained in the subcommentaries on Sankara’s classical works even learned men professing to follow Sankara have been broadcasting ideas opposed to one another in the name of that great thinker. And adverse critics belonging to other schools of Vedanta have been misrepresenting Sankara’s system are greatly puzzled and perplexed as to what exactly is the matter or method adopted in the school belonging to his tradition. It is not easy for beginners to consolidate and discriminate for themselves the various doctrines contained in the three groups of works collectively called the Prasthana Prayi indisputably ascribed to Sankara. I have therefore tried to do this to the best of my ability. Two Appendices-one containing the cardinal Tenets of Sankara’s Vedanta, and the second a list of the Sanskrit quotations adduced in the body of the work- have been given at the end of the work. The first is a free rendering and adaptation of an article by my student, Pandit H.S. Lakshminarasimha Murthy. I hope that these will be helpful to beginners to remember the principal points of the system. I have every hope that one who has mastered the leading ideas of Sankara’s Vedanta contained in this little book, may very well take to the study of more advanced books such as my ‘How to recognize the Method of Vedanta’, with assurance. I have-as usual-made over the copyright of this book to the Adhyatma Prakasha Karyalaya. May Bhagavan Narayana shower His blessing on their laudable enterprise. The author of this work, the revered Svami, Sri Sacchidanandendra Sarasvati (1880-1975), is justly acclaimed to be the second appearance of the great Sankara. 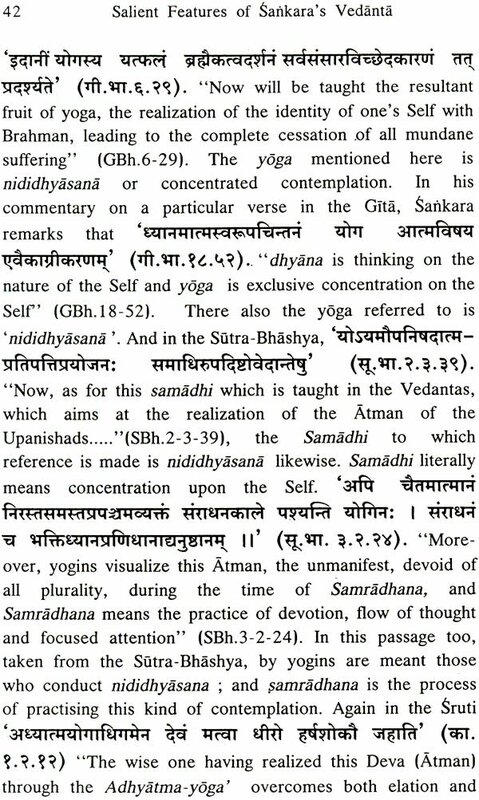 The task before Sankara when he appeared a thousand and odd years ago was to recover the true Vedantic tradition from among the mass of wrong interpretations of the Upanishadic texts. 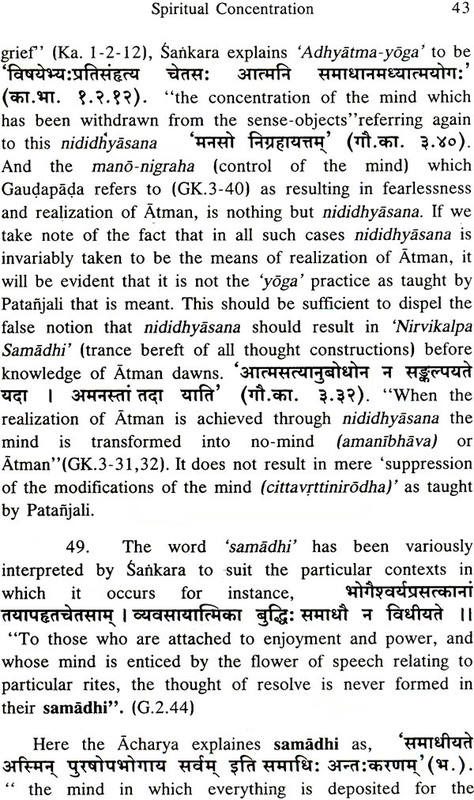 When the author of this work appeared over a hundred years ago, the mission before him was to recover the true techniques of Sankara from among the maze of perverted viewpoints of the various sub-commentaries. The task to which the revered Svarni addressed his entire life, dedicating every waking moment to it, was to set the house of Sankara in order. He realized quite early in his life that the views of the great master were being unfortunately and grossly misrepresented by his followers as well as opponents, that considerable pernicious accretions had occurred in the general standpoint of Advaita, thanks to the later sub-commentators, and that the philosophy now claimed widely to be Sankara's is not really his. The Svami undertook to vindicate the traditional method and matter as envisaged by Sankara not only by translating the original and genuine works of Sankara in Kannada, but by writing independent works in English, Kannada and Sanskrit on the subject. His literary output was truly phenomenal, and his writings prolific as they are, are characterized by precision, lucidity and erudition. But it was not before years of scrupulous and intensive study not only of the works of Sankara, but of all the sub-commentaries and glosses available, and also of the definitive texts belonging to the schools of Rarnanuja and Madhva, that he applied himself to the publication of his discovery that Sankara has been misrepresented. He was branded as a rebel by the conventionalists because he dared to question the prevailing approach to Sankara, which is moulded principally by the sub- commentaries (Bhamati and Panchapadika). But the Svami has convincingly demonstrated, by elaborate and painstaking scrutiny, that the subcommentaries have subscribed to, and introduced, many a concept that are altogether alien to Sankara's commentarial corpus, and that not infrequently these concepts militate against the tradition that Sankara attempts to uphold. This has been the achievement of the Svami's long life and single-minded devotion. And reasons are not far to seek why this discovery of the unadulterated philosophical position of Sankara (Suddha- Sankara - Prakriya) has not received the recognition, celebrity and acceptance that it merits; the strength of convention has set up strong barriers in the minds of people, and there is resistance both unconscious and deliberate, to welcome any attacks on the conventional views, however well-founded and cogently presented. It is a curious irony of our religious attitudes that the dogmatists are prepared to sacrifice Sankara's commentaries for the sake of the sub-commentaries on them, namely, Bhamati and Panchapadika. It appears all too important for the dogmatist to defend Vachaspati - misra and Padmapada even when they misrepresent Sankara. It, therefore, required of the Svami, courage of conviction and steadfast determination to speak the truth at all costs. Instances are numerous as to how attempts were made to discredit the Svami and prevent his viewpoints from being recognized. Undaunted, however, the Svami persevered and went on publishing his books in Kannada for popular edification in Karnataka, in Sanskrit for carrying conviction to the conventional scholars, everywhere in India, and in English for the enlightenment of the interested students and scholars of modern persuasion all over the country and abroad. He also moved about from place to place, giving lectures and discourses on the same theme. A simple, and unostentatious man with a retiring disposition and an ascetic temperament he was also extraordinarily peaceable and quiet. He did not appear either in his talk or in his approach in the least like a rebel. He altogether avoided heat in his arguments, and did not delight in debates or controversies. He was entirely academic and intellectually honest in his attempt to eradicate the misconceptions concerning Sankara. While his devotion to Sankara was unflinching and complete, he boldly debunked the myths and legends which the conventional Sankara- vijayas are replete with. His approach to the problem of Sankara and his accomplishments was historical and rational. The need to discover the real Sankara was felt by him when he was only thirty-five (in the year 1915). He had already studied the basic works of Sankara under the guidance of K.A.Krishnaswamy Iyer (the author of "Vedanta or the Science of Reality"), and had undergone the traditional discipline of Vedanta learning under the renowned scholar Mahamahopadhyaya, Vidyanidhi Hanagal Virupaksha Sastri. He had also by then got initiated by the then pontiff of Srngeri, Sri Sivabhinava-Nrsimha-Bharati Svami, at Kaladi (1910), and he had come under the influence of saintly scholars like Brahma-chaitanya Maharaj of Gondavali and Kurtukoti Mahabhagavata. With this rich philosophical and spiritual background, the desire that he felt to discover the real Sankara for himself expressed itself in the monograph, Mulavidya-nirasa in Sanskrit, in 1929, also called Sri-Sankara-hrdayam. He applied himself diligently to repeated study of Sankara's works (Bhashyas on the three Prasthanas) for several years to convince himself that the sub-commentaries (of Vachaspati misra and Padmapada) had not done justice to the great master.